Product #20863 | SKU SARESSE5 | 0.0 (no ratings yet) Thanks for your rating! Features 70 watts of power, a power amp and an electronic crossover. 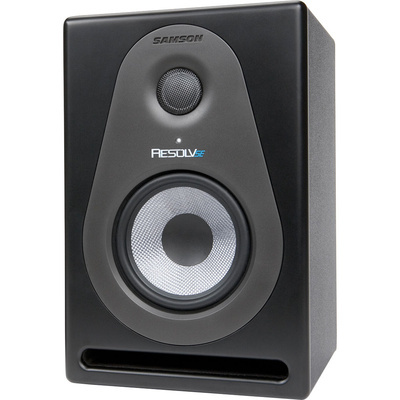 Each Resolv SE5 Two-Way Active 5" Studio Monitor from Samson features 70 watts of power, a dedicated power amp and an electronic crossover. The 5" woven carbon fiber woofer provides tight and controlled low frequency response, while its 1.25" soft dome tweeter gives the high frequencies a natural sound without unwanted resonance. The Resolv SE5 also includes a 4-position high frequency lift control, allowing the monitor to be optimized for different mixing environments. This Resolv's enclosure is constructed of solid MDF. Inset into the panel is a time-aligned waveguide that allows for a wide listening area with minimum diffraction. The SE5 is AV shielded for seamless operation near CRT monitors and other sensitive electronics. The rear panel has a balanced 1/4" TRS input as well as an unbalanced RCA input. Additionally, the front ports are slotted with rounded inner edges, helping reduce port noise at high SPLs.